A 58-year-old businessman was killed while his wife sustained multiple stab injuries in a suspected robbery incident at Dr Hira Singh Road near Ghumar Mandi. It is suspected that the robber(s) decamped with cash and gold ornaments worth lakhs of rupees. The victims have been identified as Sudhir Girdhar and his wife Neena Girdhar (57). With the Greater Ludhiana Area Development Authority (GLADA) facing stiff opposition from farmers and other land/property owners in over a dozen villages, the task of acquisition of some 3,200 acres has become a tough nut to crack. 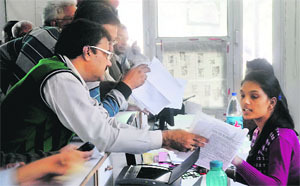 With just a day left for the payment of property tax with a 10 per cent rebate, city residents turned out in large numbers at the counters set up by the municipal corporation at its zonal and sub-zonal offices and suvidha centres today for filing their property tax returns and for the payment of tax. There is a ray of hope for poor and needy patients. Reputed doctors from the city have agreed to examine them, that too free of cost. Thanks to the efforts made by the district administration, the doctors have agreed to examine the needy patients at IMA House adjoining the police station, BRS Nagar, here once a month from now onwards. An ASI of the Jagraon police has been arrested and suspended by the authorities for allegedly demanding a bribe from relatives of an alleged member of a drug peddlers' gang arrested by the Jagraon police a few days ago with 125 gm of heroin. The ASI, Major Singh, was deployed with the CIA, Jagraon. Education Minister Sikandar Singh Maluka has warned the striking non-teaching employees working under the SSA and the RMSA in Punjab to join back their duties within three days or be prepared to face the consequences i.e. the termination of the contract. What the leaders of various political parties and NGOs failed to do for a long time, a youth of Jagraon did the same and that too single-handedly by receiving a time-bound assurance of getting established a fire brigade station here following a three-day-long hunger strike by him. The youth, Kapil Bansal, who had launched a hunger strike on Wednesday morning in front of the office of Jagraon Municipal Council, called off his strike when Jagraon SDM Apneet Rayat handed him a copy of the demand draft sent to Tata Motors for buying a truck for the fire station to be set up at the Jagraon MC. At last the girl students from Classes XI and XII were distributed bicycles under the Mai Bhago Scheme at Government Model Senior Secondary School here today. The chief guest on the occasion was Simarjeet Singh Bains, MLA. As many as 113 cycles were distributed to the girl students. With focus on the declining number of house sparrows in the region, a student of the Punjab Agricultural University (PAU) conducted a research in which he discovered that a large number of sparrows were found in some of the villages in the district which otherwise contradict the common perception of the extinction of sparrows. A seminar was organised by the Taxation Bar Association (TBA) on the topic “Tax Deduction at Source (TDS)” at Aayakar Bhawan here yesterday. BR Kaushal, a tax professional, was the speaker on the occasion. He elaborated recent changes in Income Tax provisions. IETSS-EMAT 2013, a mega event, was inaugurated today by Madan Mohan Mittal, Minister of Industries, Punjab, at GLADA Ground, opposite Vardhman Mills. The event will continue till December 2. Mittal visited more than 150 stalls and appreciated the contribution of exhibitors for the growth and development of the Punjab industry. Deputing a person as a coordinator during the recently held Professor Mohan Singh Yaadgari Mela at Bathinda proved costly to the Professor Mohan Singh Memorial Foundation as the concerned person, Jasveer Singh Grewal, allegedly announced himself as the chairman of the foundation. As the Punjab and Haryana High Court has taken serious note of the traffic problem on the Ferozepur road here and the next hearing in the case is scheduled for December 4, the top officials of major departments, including MC Commissioner Rahul Tiwari, Deputy Commissioner Rajat Aggarwal and Deputy Commissioner of Police Harsh Bansal, held a meeting with their officials here today. The Punjab IMA has requested the government to sympathetically consider doctors' demand that the nursing homes, hospitals and clinics should be considered as an industry and property tax should be charged as per the relevant clause. Here is a good news for people suffering from a debilitating urological disorder, urinary incontinence. The Drugs Controller General of India has approved the use of botox to help them manage their condition. The month of November is about to end but confirmed cases of dengue continue to be reported in the city hospitals. Medical experts say temperature is still conducive to the breeding of aedes egypty mosquito, which is responsible for spreading dengue virus. “Run-For-Reason” Ludhiana Marathon will be organised by the Round Table India (RTI) and IREO on December 1, here. Those who are waiting for income tax refunds running into lakhs will have to shelve their expenditure plans for time being as they may have to wait a bit longer. To limit the government's fiscal deficit for the financial year at 4.8 per cent of gross domestic product (GDP), despite rising subsidies, the Finance Ministry has decided to go slow on I-T refunds, besides slashing plan expenditure substantially. Alumni Association, College of Veterinary Science, Guru Angad Dev Veterinary and Animal Sciences University, which was established in 1987, celebrated its silver jubilee anniversary on Friday at Pal Auditorium, PAU. Dr HK Verma, editor of the Alumni association, revealed that the alumni meet was attended by the old students of the college, who are working as veterinary officers in the Animal Husbandry Department Punjab and rural veterinary officers under Zila Parishad of Rural Development Department. Ludhiana: An academic tour of the graduate students of Human Rights Education and Values course of Arya College was conducted to the Modern Central Jail, Faridkot. The tour comprising a group of 29 students both boys and girls was lead by Prof PS Bhogal, Head of the PG Department of Political Science of the college. A movie-making competition was held at Green Land Senior Secondary Public School, Jalandhar bypass, in which students of Classes IX and X participated. The topics of the event were ‘mathematics and nature’, ‘mathematics around the globe’, ‘life in Mars’, disaster management’, ‘planet at risk’, ‘planet to discover’ and ‘food security’. The students presented their self-made movies. 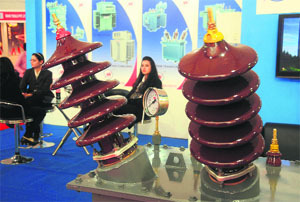 They suggested solutions to solve many problems such as global warming, food management and so on. Highlighting the nutritive and therapeutic value of amla, an Indian gooseberry, farm scientists of the Kirshi Vigyan Kendra (KVK), Ropar, Punjab Agricultural University (PAU), said amla was an indigenous fruit to the Indian subcontinent. They have observed that the cultivation of amla is common in Uttar Pradesh, but now it is picking up fast in the semi-arid tracts of Maharashtra, Gujarat, Rajasthan, Andhra Pradesh, Karnataka, Tamil Nadu, Himachal Pradesh, Aravali ranges in Haryana and Kandi area in Punjab. The students displayed their speed, stamina and strength in various track and field events on the second day of the Annual Athletics Meet of Guru Nanak Public School, Sarabha Nagar, here today. The presence of parents encouraged the budding athletes to exhibit their potential. The results of the second day events were as follows.